Open(Art) – Creative platforms for the open web :: July 12 – August 11 :: Opening Reception: July 12; 6-8 pm :: Workshops: July 13; 12-3 pm :: Eyebeam, 540 W 21st St. New York, NY. Eyebeam is pleased to announce the Open(Art) exhibition and workshop series, which marks the culmination of our Open(Art) Fellows’ projects. 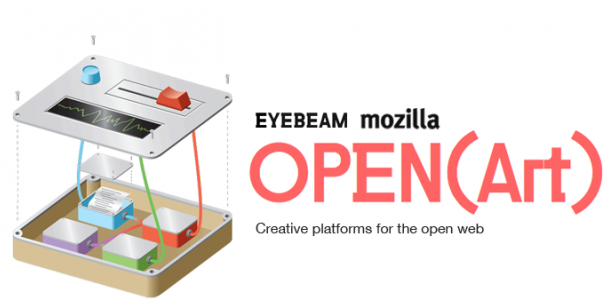 Open(Art) is a joint initiative launched by Eyebeam and Mozilla to support creativity at the intersection of art and the open web. It offers a unique opportunity for artists and technologists to collaborate on work that catalyzes participation on a global scale, and engages audiences through innovation, transparency, and utility. Join the Open(Art) Fellows — Forrest Oliphant, Toby Schachman, and Nortd Labs — for a reception on July 12 and workshops on July 13. Meemoo brings the power of app development to everyone. It is an HTML5 data flow programming environment with an emphasis on real-time audio-visual manipulation. Using an intuitive visual interface that lets users connect modules together using colorful “wires,” Meemoo lets anyone remix and build apps right in the browser. Pixel Shaders is an interactive book, platform, and community centered around harnessing the graphics processing unit (GPU) for artistic purposes. It aims to make GPU programming accessible to artists in the same way that tools like Processing made CPU programming more acessible to digital creators. BOMfu is a collaborative web repository for open hardware projects. It aims to increase the ease of use and quality for the “bill of materials” or “BOM” – the list of raw materials required to build a finished product. The goal is to open up new and more complex forms of open hardware creations. Eyebeam will host a Workshop Day on July 13th, during which the Fellows will present their projects, explain their implications, and teach participants how to use them. Forrest Oliphant’s Meemoo workshop is designed for K-12 art, media, and technology educators who might use Meemoo within the classroom. Toby Schachman’s Pixel Shaders workshop will teach the basic of “shader” programming, which are programs that run on the GPU to create real-time visual effects. No prior programming experience required. Nortd Lab’s BOMfu workshop will introduce participants to open hardware “BOMs” — or bills of material — and get users started finding open source projects and creating their own.